My favorite vignette from the books on Gee’s Bend is a description of a woman walking home from a long day in the cotton fields. She is turning over in her mind the pieces of cloth she will sew together in a quilt top that night—arranging them one way and then another, and then another. Often, she does this many days before she finally sews. Sometimes Gee’s Bends quilts are so far removed from traditional quilting that they look random. The truth is that they are carefully considered. A quilt is a bed covering made of two layers of material, sewn together, with insulation between. Usually, one face of the quilt lies face down. The other side is the “front” or top of the quilt. It is made up of many individual pieces sewn together in various patterns. After both sides are ready, the two layers of fabric and the insulation between are “tied” or sewn/quilted together with the pattern of their stitching adding another element of design to the finished quilt. 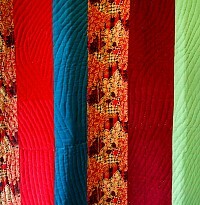 The visual success of a quilt depends on the choice of fabrics used, their colors, their shapes and sizes, and the way their patterns are arranged and quilted. Boykin, Alabama, the home of most of the Gee’s Bend quilters, has been described as one of the most isolated villages in the U.S. Here, undeterred by a scarcity of materials and long days working in their gardens or in the cotton fields, generations of black women have developed a unique tradition of quilting. Winter nights in the country can be cold. Because the older houses have no insulation and no central heating, Gee’s Bend quilts are—and were—made to keep their families warm. But from the earliest times, Gee’s Bend quilts were not only functional, they were a place where the women expressed themselves personally. 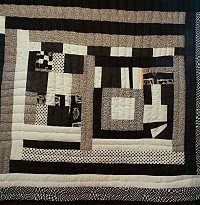 Piecing a quilt became an opportunity for experimentation or a way to express individuality and autonomy. “Doing it one’s own way” was the goal and highest standard. Traditional ideas and sewing techniques are passed on, back and forth in this tightly-knit community, but the highest praise is saved for quilts that follow their own inspiration. 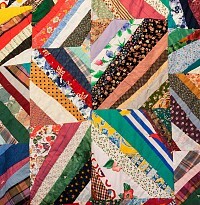 Even during the heady period after the Gee’s Bend quilts had first been discovered, many women who could surely have used the money their new fame occasionally made possible, backed off from a quilt cooperative that followed the more commercial directives of New York stores, collectors and decorators. In Gee’s Bend, quilting rules are broken. 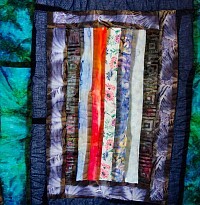 Often unable to afford new materials, the makers use pieces from feed bags, worn patches from blue jeans, and other incongruous materials together in one quilt. A seemingly quiet cotton top deviates with one shocking red flannel edge. Corduroy remnants, available for a while from an adjacent clothing factory, even polyester—nothing is wasted or forbidden. Dissimilar materials can be found side by side. 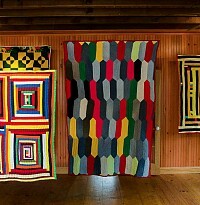 If a traditional log cabin pattern is established in one-quarter of the quilt, then in the other three-quarters, that pattern is twisted to other ends, turned sideways or upside down and backwards, done in many or in one color instead of two—becoming more interesting as the rules are flaunted. 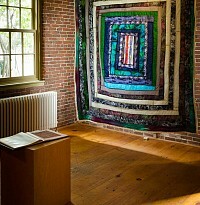 The quilts demand that the viewer, see, feel, and deal with the unpredictable. Unlike African American “story quilts,” Gee’s Bend quilts are not narratives. They are expressive in the way that the best abstract paintings are—more like “jazz,” than “folk song.” Patterns may start from tradition, but then are improvised upon. Corners do not always abut precisely. Lines need not always be straight. Ripping has its own charms. Once stated, often a pattern is exploded, turned and run askew. If it is pieced more regularly, then colors are used contradictorily. 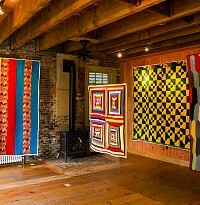 It is perhaps entirely natural that during the show of Gee’s Bend quilts at the Whitney Art Museum in 2003, a New York Times art critic raved. Leaping in one single move from the periphery to the center of the art world, these quilts were at home. The results are thought-provoking and bold. They make complicated, visual statements more true to the experience of life in Gee’s Bend than more conventionally-ordered ones could be. September 2–7, at Fiber College, 216 West Main Street in Searsport, fibercollege.org. Four of the Gee’s Bend quilters—China Pettway, Stella Mae Pettaway, Revil Mosley and Lucy Mingo—will be teaching courses at Fiber College in Searsport. 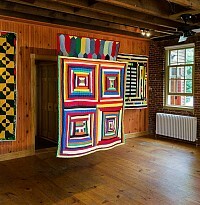 This will be the first time the quilts and the quilters have been north of Boston. “Do It Your Way” is how the quilters describe making their quilts. “You don’t have to worry yourself trying to make a ‘Star of Bethlehem’ or any of those things you got to follow a pattern for. Just take what you know and do what you want to,” writes quilt maker Jenny Pettway." There will be a two-day session to make a full size quilt top, a six-hour session to make a baby quilt and several three-hour sessions designing quilt blocks. September 3, First Congregational Church of Searsport will host a public New England boiled dinner, a discussion forum and gospel singing with four Gee’s Bend quilters: China Pettway, Stella Mae Pettaway, Revil Mosley and Lucy Mingo. The forum will be moderated by Maine Center for Contemporary Art Director Suzette McAvoy. There will also be a raffle for two quilts. Photos courtesy of Maine Fiberarts, Seeger Solutions and Fiber College.